HAVE I discovered North Yorkshire’s answer to Stephen King? Harrogate-born Steve Emmett’s debut novel kept me on the edge of my seat. I haven’t read a horror book in years, but this first offering from Steve had me finding every excuse to pick up his book as often as possible. That's not the first time he's been compared to Stephen King, by the way. Sue: How did the book signing get set up? Steve: When the paperbacks came out I rather cheekily Facebooked that I was hoping my local Waterstones might have me in for an event. They replied and said 'get in touch'! York Waterstones has a fantastic events manager, Kirstie Lount, who went out of her way to make it work. Because I have a small US publisher there were some issues with the Waterstones' wholesaler and I could not have overcome that without Kirstie. Then it was simply a case of me making sure the event got publicised as widely as possible - and of course Waterstones played their part in that, too. Sue: Tell us about what happened on the day. Steve: As you may know, just a short time before my signing, Waterstones HQ issued new and rather stringent guidelines to all its stores which seriously restrict the signings they can organise. I know of authors (not in York) who had their events cancelled and my heart was in my mouth. As I've said, Kirstie Lount is firmly for local and new authors, and mine went ahead. I'd been allocated space in the main fiction section on the ground floor of the store where I set up my banner. The staff brought me a table, chairs, book stand and, of course, their supply of Diavolino paperbacks. Julia Kavan came along to hold my hand and help scare off the customers - sorry, attract the customers! As is my luck, York Races were on that day - I'm not horsey and would never have known - and this meant the city and the store were not at all busy. So the result was a slow, steady trickle of browsers whom I tried to engage in conversation. Nevertheless, we almost shifted the stock and there are just a few copies left on the shelves (or were when I left). I was there from 10am to 5pm and it flew by. Sue: What did you learn from the exercise - would you do anything differently next time? Steve: I wish it were that simple! The new rules that Waterstones have brought in are going to make it impossible (I was going to say virtually impossible but from what the manager told me impossible is the word) for authors with some of the small publishers, and for those with POD books, to get their feet through the door. It is as if senior management has turned away from new writers and only wants the big names. I think it's a mistake because from little acorns big oak trees grow, to use an old saying. So from now on - unless things change - a lot of writers will be forced to work with small, independent stores. Hurrah! some people will say, and they may be right. It is already hard enough for new writers to get going and I think local support from their press (which I did get), radio (which I didn't get) and TV (which I didn't get) as well as booksellers can only be to everyone's benefit in the long run. I have to say something about our local TV; they love to give air time to big names from London and Hollywood, but if you are a local just about the only way to get them to take notice of you is to be a one-legged, Jewish-Muslim, unmarried mother of nine children all to different fathers, dissatisfied with your five bedroom council house. Sue: What advice would you give to authors planning to do the same thing? Steve: Do it if you can. You're not going to get rich from the sales of one event but use it to raise your profile and improve your writer's CV. Plan in advance; the more publicity you can get, the better. And check first with your publisher what they will and won't do to help - that varies widely. It goes without saying to check with the stores if they can and will make the effort to stock your book (if they already stock your book without you getting in touch, you don't need my advice!). Steve's next appearance is at the Northampton booQfest on 16th September. He's giving a reading from Diavolino, plus a short talk about horror followed by a question and answer session - and Julia Kavan, quite by chance, had been asked to act as moderator. His venue is the amazing Charles Rennie Mackintosh House and Galleries ( http://www.78derngate.org.uk/) and, he says, "I'm now doubly looking forward to it. I'll have some books to sign and sell, too". Find Steve here. 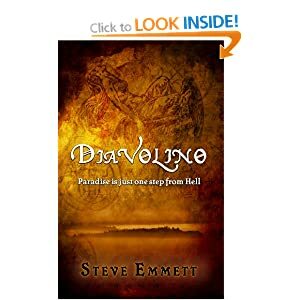 His website's full of information and you can find all the buy-links for "Diavolino" in both ebook and paperback. Interesting post - thanks for sharing the experience, Steve. Good luck with your next signing event in September! This was great! Thanks for sharing. Thanks Katie....oh chocolate. I'll have some of that, Shelly! It was a really interesting experience. Being there for the whole day allowed us to see how readers chose their books - there were some who immediately went to the 3 for 2 offers or buy 1 get 1 half price, picking up several novels in a series. I was surprised at the number of people buying books as gifts - there was one new release that even came ready gift-wrapped, very pretty, not sure what it was about tho... I learned a lot from being there, and I'd like to thank Steve for letting me lurk (I never did get to hold his hand...he kept running away :-) ). I'd love to work in a bookshop, Julia, for that very reason - to see how people buy their books. Must be fascinating. I must admit I go to the 3 for 2s first... It must've been great for Steve to have you there for support - wish I'd been there too. Shame the chain is making it difficult for authors to appear! Book signings scare me more than public speaking. By a large margin. Thank you for hosting me today, Sue. And thanks to everyone who has commented. It's incredible, isn't it Alex?. Me too Libby :-) You're welcome Steve. Interesting! Haven't come across many posts about book signings, so this was new material. Thanks for the tips. I thought your booksigning was great, Steve. Lovely to finally meet you and I'm looking forward to seeing you at Booqfest. Interesting post and a great interview! I liked hearing his perspective. I think the idea of using a book signing to raise your profile is probably the best one, and I know from past experience that as a reader I feel more comfortable approaching a signing table if two authors or two people are already present. Great advice. I'm not anywhere near that stage, but it's great to consider for the future. Thanks for sharing! I think book signings are one of the big things book stores have going for them. They need to encourage more signings and other events that draw in book fans and potential customers. Great interview, Susan. This is not the first time I've heard about Waterstones ignoring smaller publishers and new writers. It makes me feel so angry at the short sightedness of their policy. Is it any wonder so many writers are going Indie! They and the larger publishers could well find they've been left behind because new technology has changed things so much. Crazy...I wonder what is the reason behind the change in who can do author signings? I think it's awful that they would discriminate like this. Angela, I have my view that it's all to do with money. Everything today is about taking fewer risks and hoping to increase profit. Look what writers we'd have missed if it had always been the same. Thanks for your comments, everyone. Great response.